I just had a thought, one can have their pet implanted relatively cheap here (about a 10th of the cost of ordering just a chip internationally). Does anyone know whether they would be viable? I see that the majority are encapsulated in bioglass and coated parylene. I have found at least six official suppliers here. Whether they sell to the general public or not is another thing. Absolutely, I think some like the BioThermo are essentially just repackaged and marketed to us. I got mine through a cattle tagging company but it's the same thing. Veterinary products have to go through extensive testing for safety and sterilization. They definitely work. It's not like a human body is vastly different from other animals. I just purchased a HITAG S256. $11 with postage. Not sure if I will do the implantation just yet. Might look into reading writing and fiddling a bit first. Let us know how it goes! Also did it say anything about an "anti-migration sheath" or something along those lines? Yeah they are parylene coated. Wait. I lie. I am actually not sure on this one. Amal Graafstra had the 2048k version implanted (http://amal.net/?p=3540) and subsequently removed and apparently it does not have the coating. Yay! Chip just arrived! It's a tiny bit smaller than the xBT chip on DangerousThings but otherwise much the same spec wise. Gonna wait til my reader arrives from China before testing and implantation though. 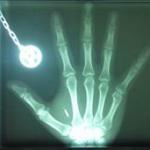 Where did you get it from and did you implant it with a injector or did you do it with a scalpel. Some of them actually have a polypropylene cap, opposed to parylene, that binds to tissue. I haven't personally removed mine, but I know that Amal has spoken about its removal before and there is a thread somewhere on Dangerous Things. AFAIK the parylene makes it a little more difficult to remove as one would normally make an tiny incision and 'herd' the implant out through the hole whereas with the parylene it needs to be a direct excision through a larger, well placed incision. Some pet implants do have parylene. Mine does. But I have not implanted it as it operates on a largely unsupported frequency range and is therefore pretty impractical as an implant. I ordered some in the end to test and they all seemed fine but before I injected I checked frequencies and had gotten a pet based frequency of 134.2 (or similar) which wasn't something that would work with other parts of my kit. Just remember to check what you're getting if you do.